Snow on wisteria or plum blossoms. Sei Shonagon was a lady-in-waiting to the Empress of Japan during the Heian period. One day, she was given some extra paper that had been lying around and decided to use it make a pillow book – a book kept by her bed, where she jotted down stories, memories, lists, and whatever else came into her head. I loved this little book a lot more than I expected to. For the history buffs, it’s an incredibly detailed picture of court life in imperial Japan. For the artistically inclined, Shonagon’s images and descriptions are beautiful and stirring (“When crossing a river in bright moonlight, I love to see the water scatter in showers of crystal under the oxen’s feet.”). For the intrigue-inclined, there’s tons of court gossip that Shonagon dishes out for us, and she also gives her reader lots of interesting anecdotes about the men she’s slept with (she has lots of rules for how gentlemen should and should not behave when visiting a lover at night). 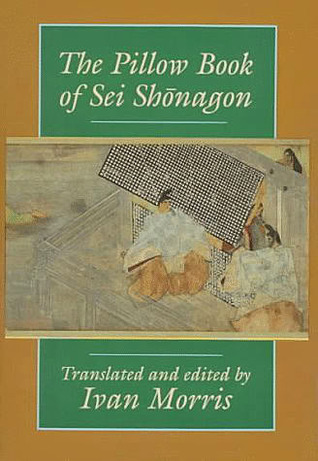 The best part, for me, was the whole tone of the book – if I were to follow Shonagon’s example and make a list of “Things That Give a Comfortable Feeling”, I would put this book at the top. Whenever I was stressing out about tests or papers or work, it was amazingly soothing to pick up this book and read nice anecdotes about rich Japanese women visiting temples, reciting poetry, writing lists, and generally being very clever and elegant all the time. A lovely, charming book. Should be read somewhere near a garden, while drinking tea and listening to nice music.